I am what they call in our village one who has not died yet -a widow, eighty years old. OK, I am pleased that this book was as beautiful as everyone said it would be, but you could have warned me about how sad it was. I was blubbering away for the last half of the book, the whole episode took me completely unawares. This book is the fictional memoirs of Lily, a farmer's daughter. Now in nineteenth century China, if you were born a girl, you were considered to be worthless, an extra mouth to feed that was not needed. Families only wanted boys, to help with the family business and carry on the lineage. So Lilly was ignored by her family through her childhood until the time came for her to have her feet bound. In this period in China, a woman's eligibility for marriage, was judged by the size and shape of her feet. The aim was to have her feet as small as possible, to secure a wealthy match. The local matchmaker informed Lily's parents that once bound, her feet would be flawless. By binding her feet, Lily will change the fortune of her family. The whole binding process is absolutely horrible. In great detail, the book explains how they would bind and break the foot, until it was about six inches long. Can you imagine them being allowed to do that today. The toes are broken first and the the bridge of the foot; the girls are made to walk on these feet constantly until they begin to mold into shape. The whole process takes two years and young girls (aged six and upwards) could die from this. I was astounded that practices like this ever occurred. The main part of the book, looks at the relationship between Lily and her laotong, Snow Flower. 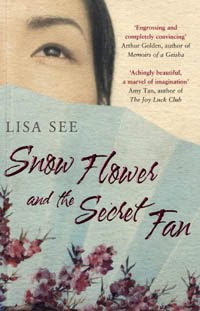 Snow Flower was closer to Lily than anyone else, even her husband and the book follows the joys and the trials of their friendship. The main form of communication between the two friends is via a fan which they write on in nu shu (a secret written communication between women). They always attend special events together and the book follows their relationship from their early childhood right up until Snow Flower's death. As Lily's life becomes fortunate, Snow Flower's descends into misery. It was just so sad to read, especially during the period when their friendship deteriorated. Lily was lucky to live the life she did, but many women in lower social groups really did suffer and were very badly treated by their in laws and husbands. The book is full of wonderful descriptive passages and you could easily immerse yourself into life in China during the nineteenth century. The book is one of those that leaves you pondering life afterwards and again it makes you realise how lucky you are to live in society today. If you haven't read this book full of passion and love, but also hardship and sorrow,then you must read this. If you loved Memoirs of a Geisha by Arthur Golden, then I absolutely insist you read this. Just remember to keep a box of hankies close by. Thanks for this wonderful review. Having just finished THE EMBERS OF HEAVEN, you know the book that 'is but isn't about China', I'm keen to read more on the subject and this sounds ideal. Definately one for my wish list, along with a box of tissues. Nice review. I read it a year or two ago and loved it. I read See's most recent novel this year - Shanghai Girls. It's pretty good and apparently will have a sequel at some point (which is a good thing!). This is in my TBR pile and I can't wait to read it. I'm so glad to see you loved it! I'm still not sure if I want to read this. Nice review. This is one of my favorite books of all time. I just love how emotional this book was. Blodeuedd - that is a shame. It really is a fantastic book. Petty Witter - you will love it. Mary - I had heard that Shanghai Girls wasn't as good. Not sure if I want to read that one. Bermudaonion - you will love it too. Amanda - have you read Memoirs of a Geisha. If you enjoyed that, you would enjoy this. Kate - glad to hear you loved it too. Shanghai Girls is a much different book than Snow Flower. I liked it. I didn't read past the first paragraph where you said it was very sad. I have this one on my shelf to read and hope that I enjoy it (although now I'll be prepared with a box of tissue). I LOVED this beautiful book, and the concept of "old sames". Terrific review! I've not seen the cover you display in your post before. I can't wait to read Shanghai Girls! It sounds like this would be perfect for the Women Unbound challenge. I'll have to keep it in mind! EXCELLENT REVIEW!! This was my #1 book, the year this one was first published. Loved it so much. Hmmm - I think I'll need to look for this. This book has been on my shelf for ages and I really want to read it. It sounds so good and so many people have loved it. Memoirs of a Geisha was one of my favorites. It looks fantastic! Great review! The cover of this book is beautiful. Your review had me almost running (if I could! lol) out the door to the bookstore. I enjoyed some parts of Memoirs of a Geisha and know I will love this book. The binding of women's feet is horrible and debilitating. Thank you for a terrific review, Vivienne. This was such an emotional read for me as well, then I passed it on to my sister who called me to ask me why I didnt warn her how sad it was! She loved it too though. Oh my gosh, the foot binding had me cringing. I have been sitting on this book for SUCH a long time, I think worried it just won't live up to the hype or something. I really need to get on with reading it, but then again, seriously. Get in line. Oh it is a book that will leave you misty eyed. What a great review! I've been meaning to read her other books but haven't gotten around to it. Coincidentally I'm reading this book right now. I read only first paragraph of your review, but I'll come back again once I finish, which should be soon!